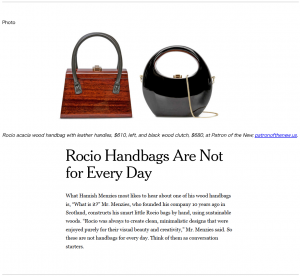 What Hamish Menzies most likes to hear about one of his wood handbags is, “What is it?” Mr. Menzies, who founded his company 10 years ago in Scotland, constructs his smart little Rocio bags by hand, using sustainable woods. “Rocio was always to create clean, minimalistic designs that were enjoyed purely for their visual beauty and creativity,” Mr. Menzies said. So these are not handbags for every day. Think of them as conversation starters. Taking “statement bag” to a new level (the statement being “Is that even a bag?”), the Coco handbag by Rocio has an odd shape, finish, and material, but we couldn’t be more smitten. All of the British brand’s designs are crafted using sustainable wood– the Coco is hand-carved from a single piece of Acacia, which is then covered in rich, shiny lacquer. Beyond its eco-friendliness, we’re also big fans of the space-age shape, and happy, bright colors. This is a bag that would look just as nice on your nightstand as it would on your arm.